Mango phirni is an Indian rice pudding or rice kheer with full cream milk, basmati rice and mangoes as the main ingredients. 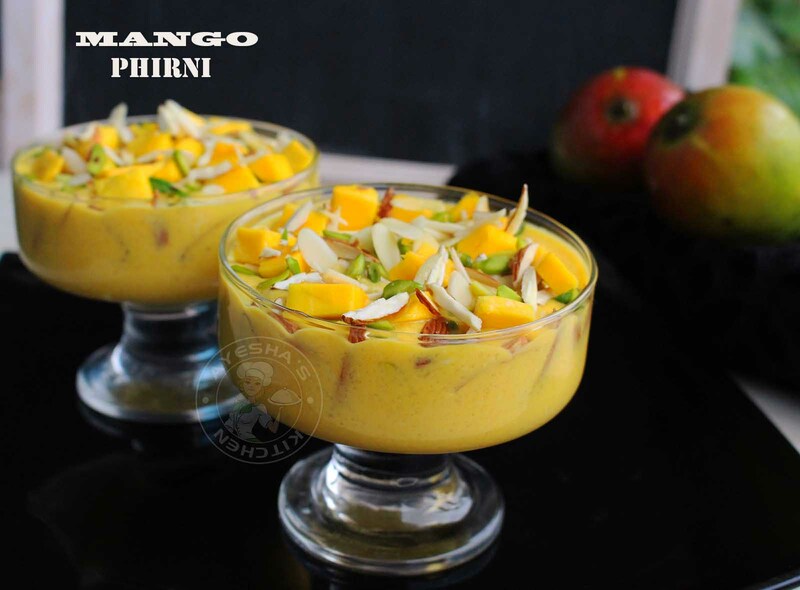 Mango phirni is yet another variation of the popular Indian dessert phirni recipe. As this is the best time to share mango recipes, I just thought of incorporating mangoes in various recipes. The creaminess of milk and the texture of mango chunks along with nuts makes this a super dessert. Kheer / payesh/ phirni/ payasam/ fereni is a rice pudding belongs to Indian cuisine which is typically served after a meal or as a dessert. 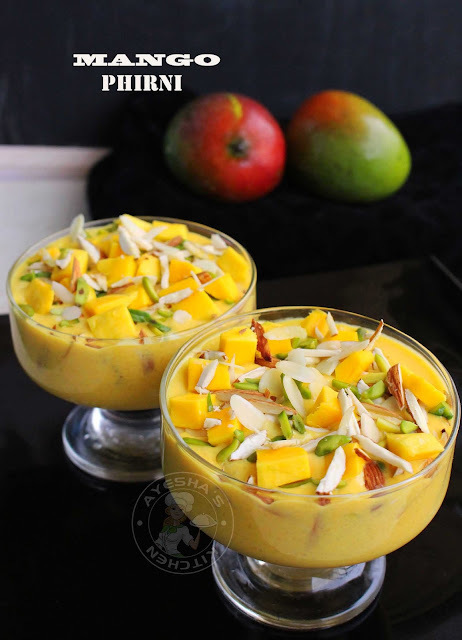 Though it tastes very similar to mango rice kheer with a pudding consistency, it belongs to a phirni category. Phirni recipe is a North Indian sweet pudding which is prepared during special occasions or festivals like diwali, holI, eid or Ramadan. One of the main difference between phirni and rice kheer which I noticed is that phirni is served chilled whereas rice kheer is served warm. 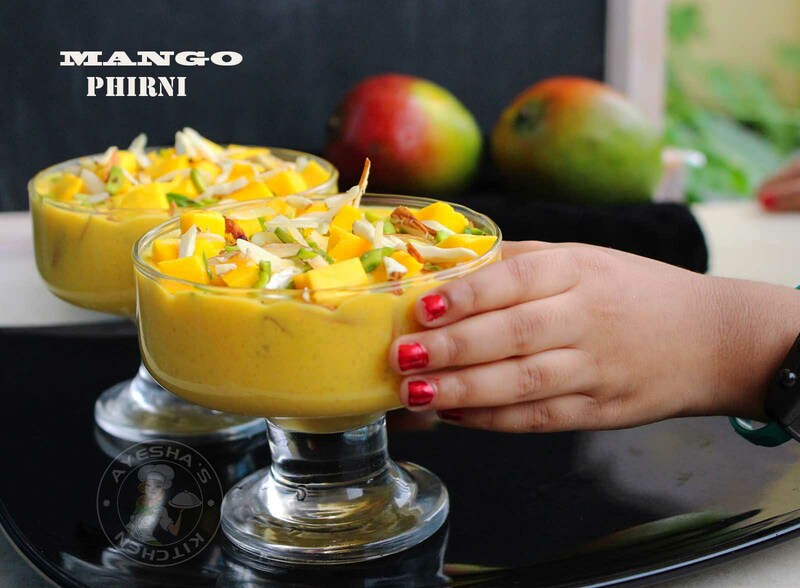 Here is the recipe showing how to make mango phirini / mango puree recipe / mango dessert recipes /mango treats / desserts recipes /easy to make desserts /party desserts /Indian sweet dishes /creamy rice pudding /mango pudding. Add mango chunks of a ripe mango in a blender and blend it to a smooth paste without adding water. Refrigerate this puree until use. Soak the rice (i used basmati rice) for half an hour. Drain the water completely. Coarse grind it to a paste. Then add 2 tsp of water to this paste and mix well. Set aside. Boil the milk. Once it starts to boil, reduce the flame. Add this rice paste to it, stirring continuously until the mixture thickens like a porridge. To this add condensed milk , cardamom powder and combine very well. Remove from flame. Let it cool. Refrigerate it for 30 minutes or for an hour. Once done, take out of the refrigerator. Add the mango puree (quarter cup only), chopped mangoes, chopped nuts and refrigerate further until you serve. While serving garnish with almond flakes, chopped mango, pistachios sliced etc and serve chilled. Once cooled the consistency of phirni will be very thick. So remove from flame when u reach minimum thick consistency. You can cook the mango puree to get rid if the raw taste . In the above video, i just cook the mango puree for perfection. Use sweet mangoes for this phirni recipe. Adjust the sweet as per the sweetness of mangoes. Do not add more mango puree than required. Only quarter cup of mango puree is required for 2 cups of milk. The rice paste must be cooked well and stir continuously or else it will form lumps.